Halloween is one of our favorite family holidays. Mostly because we love to dress up, make yummy treats and go to the pumpkin patch. I guess you could say we just love the fall. Many families have traditions of decorating gingerbread houses for Christmas, but we have the tradition of making graveyard brownies. 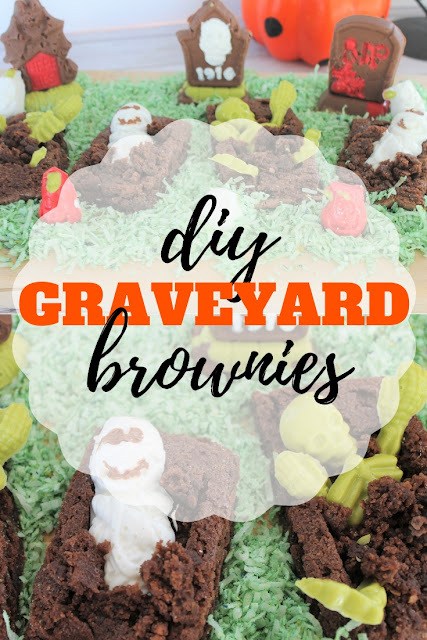 What are graveyard brownies? Well, mostly they are just regular brownies. However, we dress them up with candy skeletons, mummies and pumpkins. It has become a little tradition that my children look forward to. Not only do they get to make brownies but they get to make a chocolate mess while doing it. I thought your family might enjoy this tradition as well. So I am sharing my favorite brownie recipe that I've been making for more than 15 years. (No joke people!) They make great chewy brownies for this project. Mix shredded coconut with green food coloring to make the "grass" in the graveyard. Place on a cutting board or platter. 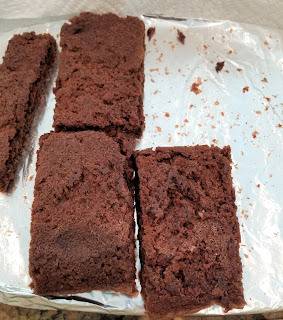 Cut cooled brownies into 6-8 rectangle pieces. One for each "grave". Scoop out the center but save the brownie pieces. 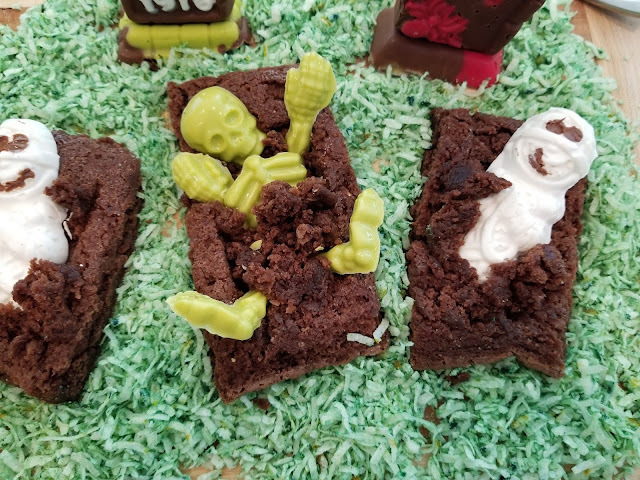 Place candy skeletons into each of the brownie graves. Place scooped out brownie pieces over the skeleton parts to make the grave look filled in. Add graveyard headstones or pumpkin candy decorations on the outside to finish you graveyard. This is a super fun way to decorate a table and even fun to do with the kids. I know my children loved helping me make the candy molds and put the display together. Mix margarine, sugar and cocoa in a large bowl. Add flour. Mix until flour is not longer visible. Pour mix into a greased 9x13 pan. Bake at 350° F for 25 minutes. Meanwhile, melt white chocolate candy melts in a double broiler or microwave. Place melted candy in Halloween skeleton candy molds. Allow to cool in refrigerator. 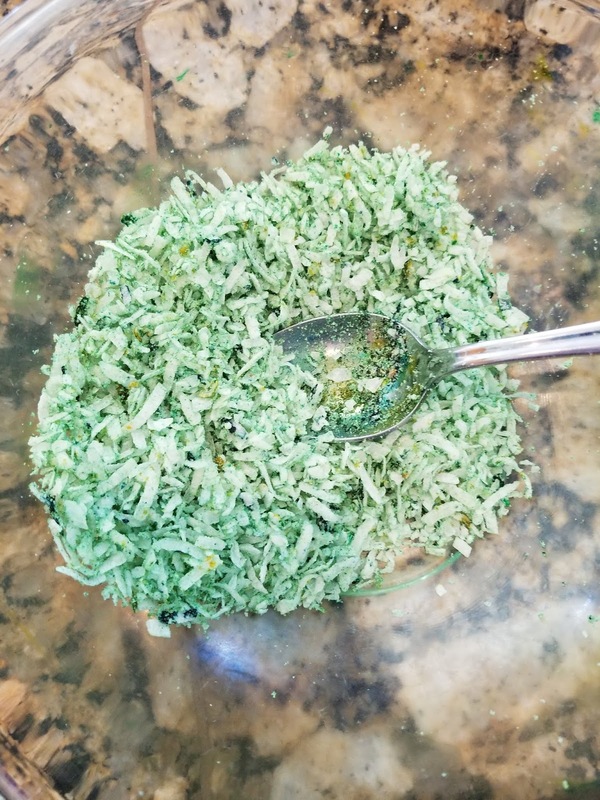 Mix shredded coconut with green food coloring. Set aside. On a cutting board or platter, pour shredded coconut onto the surface. 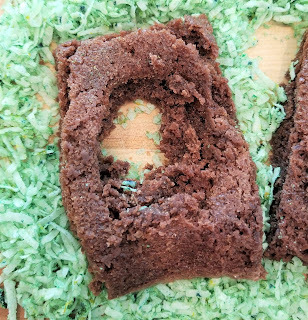 Place scooped out brownies in the middle. Place candy skeletons into each of the brownie graves. Place scooped out brownie pieces over the skeleton parts to make the grave look filled in. Add graveyard headstones or pumpkin candy decorations on the outside to finish you graveyard.